This mild and creamy jalapeño cilantro salsa is made with fresh jalapenos, cilantro, garlic, lime juice and olive oil. 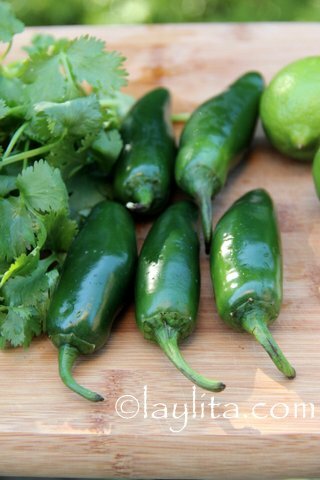 This is my brother Ramon’s awesome recipe and I have to warn you that this jalapeño aji or salsa is highly addictive. It has a lot of flavor without being overly spicy. Ramon (Moncho) does a good amount of grilling and uses this sauce to accompany grilled meats, seafood, and more. I also like to use this sauce for basting when grilling. 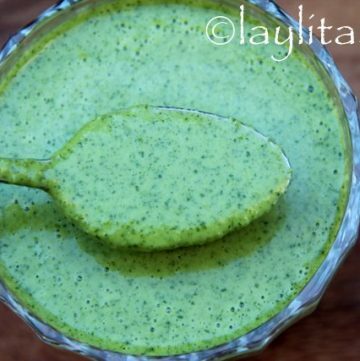 This jalapeño cilantro salsa can also be used as a dipping sauce for empanadas; it also goes great with patacones or plantain chips. 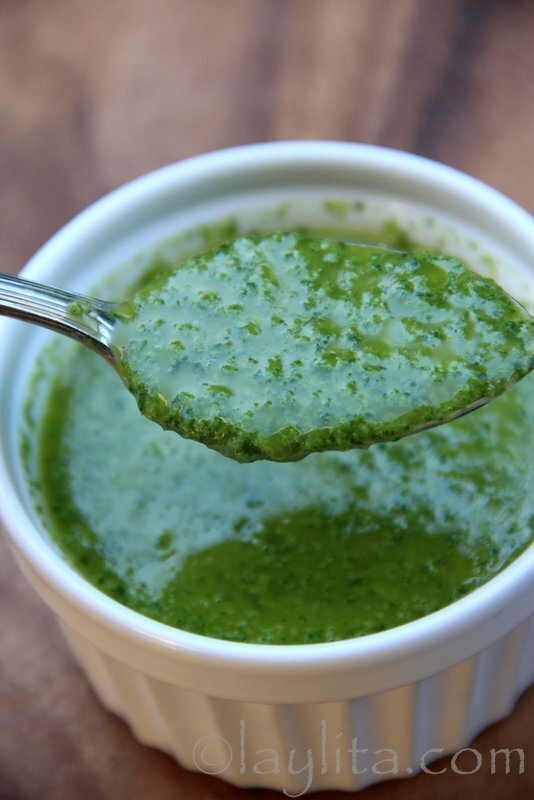 I’ve also used it as a salad dressing – it works really well when you’re looking for something that will add a spicy (but mild) touch to any dish. 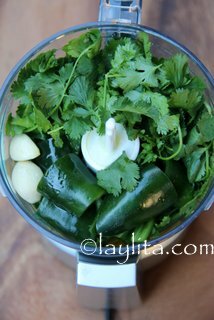 Mild and creamy jalapeño cilantro salsa recipe made with fresh jalapenos, cilantro, garlic, lime juice and olive oil. 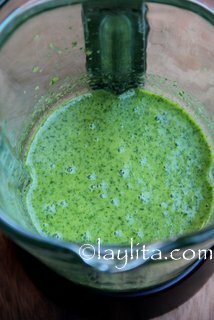 Place all the ingredients in a mini food processor or blender, mix/blend until all the ingredients are completely crushed and the sauce is smooth. 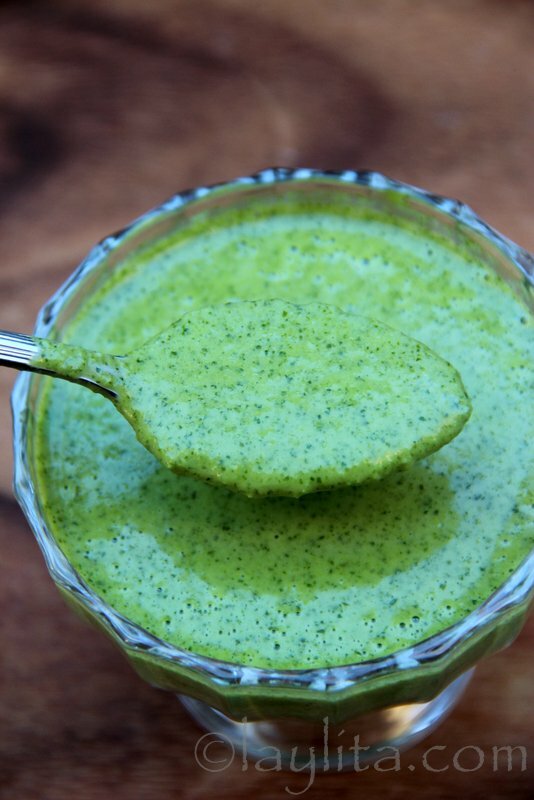 Make sure the sauce is blended well enough so that the olive oil is well mixed into the salsa. Use immediately or refrigerate until ready to use. The salsa is best if used the same day it’s prepared. 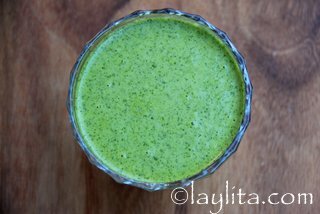 You can blend the ingredients in a mini food processor or in a blender; the consistency does come out smoother in a blender. However, sometimes it’s just easier to make it in the food processor. 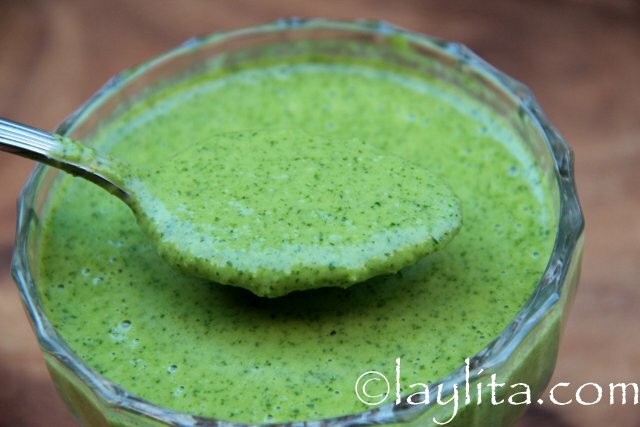 Regardless of which appliance you use it’s important to make sure that even after the all ingredients are crushed and blended, you still need to blend a little bit more to make sure that the olive oil is completely incorporated into the sauce. 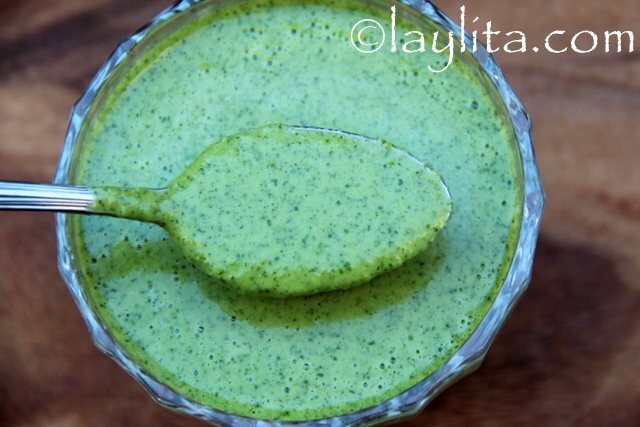 This aji salsa is very similar to my aji criollo recipe. It has very similar ingredients, but while you can use any variety of hot peppers for the aji criollo, for this salsa the key is to use jalapeños, it doesn’t have the same flavor if you use any other type of pepper. Also, I use water in the aji criollo, while this jalapeño cilantro salsa uses only olive oil. This jalapeño cilantro salsa reminds me of a chimichurri style sauce because of the combination of olive oil, garlic and herbs; even though traditional chimichurri uses finely chopped herbs. This is delicious! Thank you for sharing this recipe. I added a bit of the lime zest also. So many uses for this. 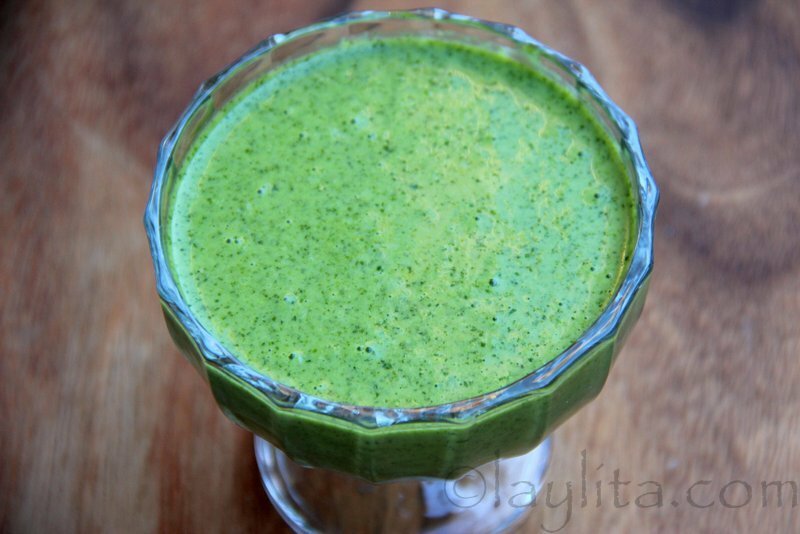 Very easy to make and very pleasant to eat. However in order to get a modest amount of heat, one might leave one jalapeno unseeded and undeveined until doing a taste test. It worked for me. I made this and my family loved it!!!! This is sooooo good! Thanks for sharing. We have been using it on tons of dishes and it gives food great flavor. Do you include the olive oil while you blend it, or you put it at the end? 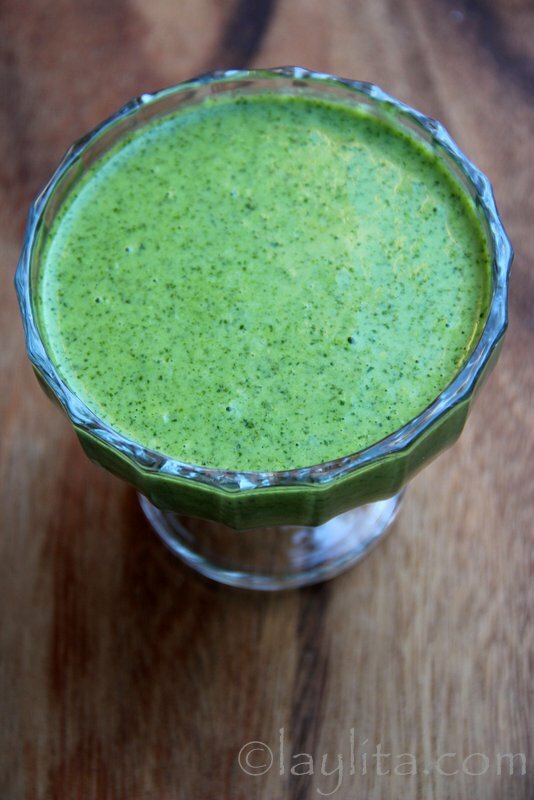 Olive oil is included in the blender. Could avocado be added to this? This was absolutely delicious!!!!! Thank you!! !